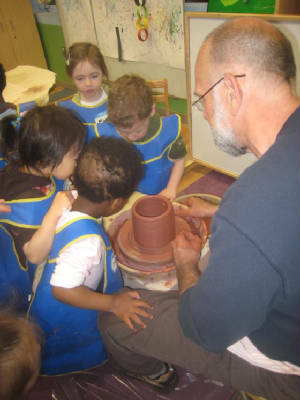 The children of the CDC had an amazing experience with their new friend, Mr Don the Potter. Don Bradford has been an artist/potter and clay instructor for over thirty-five years.First trained as an art teacher,Don taught in the public schools of New Jersey for ten years before devoting his time fully to clay and ceramic instruction. In addition to observing and engaging in the techniques of the pottery wheel, the children were taught how to make their own pinch pots. The large pot that the children helped create on the wheel and a second large pot that Miss Hope's class is very proud of will be on display as soon as they dry. The children's pinch pots will be painted by our young artists and sent home next week. What an incredible experience it was for all of us. On Thursday, February 5th at 10:00 AM. One of the most unique and beautiful forms of Turkish art is Ebru, or water marbling. Ebru is formed by drawing designs with dye on top of water and then carefully placing paper on the surface of the water in order to absorb the dye. 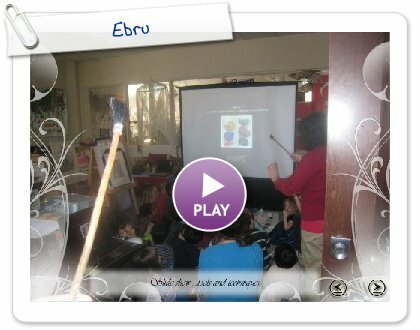 Each child had an opportunity to create a one of a kind piece of Ebru art! Please enjoy the slideshow of of this unique experience.